Fourth Row Center: Film Writings by Jason Bailey: On DVD: "A Muppets Christmas: Letters to Santa"
For those of us who grew up watching the original Muppet Show and the first three, Jim Henson-controlled Muppet movies, spring 2008 brought a piece of long-awaited good news. Following the unexpectedly puppet-ccentric R-rated comedy hit Forgetting Sarah Marshall, that film’s writer and star Jason Segal and its director, Nichols Stoller, announced that they had signed to create the next Muppet feature film. Lest enthusiasts fear a Meet the Feebles-style corrupting of the characters, Segal insists it will be “incredibly old fashioned,” which this hopeful viewer reads as, still appropriate for family audiences, but imbued with the sly humor that made the Muppets so many fans outside of their target audience. The fact of the matter is, since Henson’s untimely death in 1990, the tone and style of the Muppet movies and TV shows have shifted, and not terribly subtly. Once the Henson studio began collaborating with Disney in early 1990s, the Muppet theatrical films, TV movies, and specials were geared towards Disney’s audience of children, first and foremost, and if the parents enjoyed them too, then that was fine. But the inside showbiz jokes and satirical jabs were mostly gone, and the genuine heart of the early Muppet pictures was replaced by syrupy, vanilla formula. A Muppets Christmas: Letters to Santa, an hour-long holiday special that aired on ABC in late 2008, falls mostly into this realm; it has its moments, but is mostly aimed squarely at young kids, without much to keep anyone else interested. 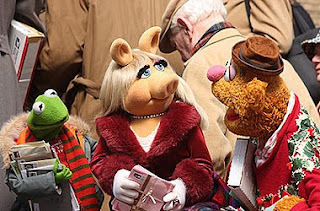 The special begins with Kermit, Piggy, Fozzie, Gonzo, and Pepe the King Prawn (he’s a new character, fellow old-timers) in line at the post office on Christmas Eve, dropping off cards and a letter to Santa from their neighbor girl, Claire (Madison Pettis). They wander into the sorting room, where Jesse L. Martin leads them in a cringe-inducing song about the post office. They have a mishap in the sorters and are tossed out; when they get back to their apartment building (which appears to be inhabited solely by Muppets and one family; was this a rent-control situation? ), they discover that in the mess, they ended up in possession of three letters to Santa, including Claire’s. (If you ask me, that’s the risk Claire was running by not mailing the damn thing until Christmas Eve, but I digress.) The post office is already closed, so the rest of the special concerns their attempts to get the letters to the North Pole. The show’s comic bits are hit and miss—Sam the Eagle’s pop-in is very funny, perhaps the comic highlight, and there’s a wonderful bit with Dr. Bunsen Honeydew and Beaker (and Beaker’s new girlfriend, played by Petra Nemcova). Nathan Lane, just about as game an actor as the Muppet folks could hope for, gets some laughs with his scenes as a suspicious TSA inspector, and Sopranos co-stars Tony Sirico and Steve Schirripa make a welcome appearance as (surprise) gangsters. However, neither Uma Thurman nor Whoopi Goldberg get much to do, and Jane Krakowski’s comparatively large supporting role as Claire’s mom makes no use of either her comic gifts or her killer pipes. As with all of the Muppet projects since Henson’s passing, the new voices take some getting used to; Steve Whitmire has been voicing Kermit for almost twenty years now, and it still sometimes sounds off, but nowhere near as wrong as the puppeteers doing Scooter and Janice. There are occasional dopey music cues (the use of a circus trombone after a couple of the bad jokes is a poor choice), and the songs by Paul Williams (he also penned the memorable tunes of The Muppet Movie and the not-quite-so memorable numbers in The Muppet Christmas Carol) are mostly bland and forgettable. However, the show does manage to work its way to a sweet, warm ending that forgives some (though not all) of the lapses that preceded it. Very young children, who are presumably the audience for A Muppets Christmas: Letters to Santa, should enjoy it just fine; the Muppets are cute, the jokes are easy, and it has plenty of Christmas cheer. But older viewers, longing for the glory days of Muppet entertainment, won’t find much of that here. "A Muppets Christmas: Letters to Santa" is currently available on DVD.